This is an excursion with Lancs & Yorks coaches leading. The reporting number is H455, and the loco is not identified. The clue is mile post 16 on the left, but where from, and where is the train going? The location is clearly on the LYR, but I have no idea where. A big train for a small engine, especially in hilly LYR country! I would have said that this is on the LNWR: LNW style mile post, Webb standard hut - for a crossing keeper, signals in the distance look more LNW that L&Y - but a bit far off! Intended job for one day - research LNW train reporting numbers! At first glance this is another quite unremarkable view of a moving train headed by a '6ft 6in Jumbo', but on closer examination it contains much of interest. The train is proceeding along the main line from Manchester to Liverpool and is about to cross over the West Coast Main Line, milepost 16, on the left, being almost on the bridge. In the distance is Parkside No. 2 signal box with home signals for Manchester (off), and for Lowton Junction and main line at Golborne Junction. On the front of the engine is the telegraphing number H465; the prefix 'H' was used for trains on the North Wales section in the early 20th centurty, so as all the carriages are Lancashire & Yorkshire Railway stock the train may well be an excursion from some point on that company's system, such as Bury, Rochdale or Bradford, to Llandudno. If so, the 'Jumbo' has taken over from an LYR engine at Manchester (Victoria) and in view of the load has perhaps been substituted for a larger engine that has failed. Certainly it will be banked from Warrington No. 1 to Acton Grange. The most remarkable feature is the stock, which consists of one of the two LYR dining car sets built in 1908-9 for the Liverpool (Exchange)-Hull and Liverpool (Exchange)-York and Newcastle services, but strengthened probably for this working. The first vehicle is a 56-foot four-compartment Corridor Brake 3rd to D91, of which only six were built for use in these dining car sets. Next come two Corridor 3rds to D90, also built for these sets. The fourth vehicle is something of an oddity, being one of 13 open side-corridor 3rds built at the same time to D97, one of which was also usually to be found in the dining car expresses. They were arranged like any normal side-corridor coach but were open, having no doors leading to the bays of seats, no partitions dividing each bay from the next and no tables in the bays. In later years, they were much used in push-and-pull sets, for which they were wll suited. In sixth position is a 65ft 6in elliptical roof 12-wheel Kitchen 1st Dining Car, either no. 213 or 214, which was normally coupled next to an Open 3rd, so that meals could be served to passengers of that class. 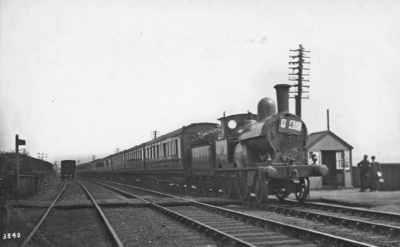 In this case, the vehicle behind it is not the normal one used for that purpose, which seems to date the picture as during the First World War or later; on the other hand, the low number of the picture in the Locomotive Publishing Company list, 3340, seems to indicate a date well before the war. The remaining coaches are of the same types and variants as those leading. In total the tare weight of this ten-coach train is 278 tons, not bad for an unsuperheated 2-4-0 classified by the LMS as '1P'. No wonder they were nicknamed 'Jumbos'! I don't think you should take it to heart Ted that no one has remembered having seen this photo before. I suspect I'm not alone in having lots of books with photos in which I simply cannot remember, which can result in much wasted time on occasions when I say to myself "I know I've seen this before. I just can't remember where". Thank you to Ted Talbot and I am sorry to say I do not have the book. LPC numbers can be misleading - this is the second card to be published as 3340, and the number on the negative means it was not published until 1928-30 which was around the time that (probably H.R. Norman) started the LPC on putting the number on on the negative so that it was printed on the picture. The card was published with the EC4 post district whish again pushes the date well into the 1920s. The carriages could be in LMS livery? Actually, John, you and I have discussed this photo before, with David Patrick, at a Railway Collectors' Fair about six or seven years ago, either at Stafford or at Kidderminster. I remember saying that the train was on the Manchester-Liverpool line and that full details were in the book. It is difficult to be certain about the livery of the carriages, as the side of the train is in shadow - all credit to the photographer for taking the shot against the light and achieving such an excellent result. The two men chatting away on the right complete an evocative scene of times long gone. But whatever the livery of the carriages, the engine at any rate is in LNWR condition - lined livery, numberplates and lamp sockets. So if the date is after the Grouping, it cannot be long afterwards, as lamp irons were fitted fairly quickly, within a year or two at a guess, perhaps a bit longer (have never tried to work it out). Have you any idea of the name of the photographer? And have you any more photos like this one? I suspect the photographer may well be H. Gordon Tidey. Shots with the light on the "wrong" side were a favourite of his. He certainly took several expresses not far away near Golborne including a care-worn 19" Goods at the head of a very mixed rake on a Whitehaven-Euston express again taken on the shady side. This is I think a similar quality picture.